OBJECTIVE To review the evidence on vitamin D (VTD) insufficiency and deficiency from a Canadian perspective and to highlight some of the known and evolving implications of insufficiency or deficiency for health. QUALITY OF EVIDENCE PubMed was searched for articles on VTD insufficiency or deficiency and the role they play in various diseases and conditions. Level I and II evidence indicates that lack of VTD has a major role in short- and long-latency diseases. MAIN MESSAGE The long winters in Canada and lack of exposure to the sun contribute to lower levels of VTD among Canadians in late winter and spring. Currently recommended levels of fortification and supplementation are likely not high enough to restore adequate levels of VTD in the body. Repletion and maintenance therapy might be needed. CONCLUSION Many Canadians are at risk of VTD insufficiency or deficiency. Assessment of VTD status is important because optimal levels of VTD have been determined for various conditions. Low levels of VTD have negative implications for bone health and the health of other cell types. This article reviews the guidelines for adequate intake of vitamin D (VTD), some of the basic physiology of VTD, and the relevance of the VTD receptor in some disease states. The definition of VTD status, and the prevalence, etiology, and treatment of inadequate status for various diseases will be discussed. Canadian recommendations for adequate intake of vitamin D: 1975 to 2007. Vitamin D, a steroid hormone produced in the skin, has specific regulatory or functional effects on other parts of the body. Vitamin D is hydroxylated in the liver to 25-hydroxyvitamin D (25[OH]D) and further hydroxylated in the kidney to 1,25-dihydroxyvitamin D. Hydroxylation in the kidney is regulated closely by parathyroid hormone (PTH), hypocalcemia, and hypophosphatemia and is inhibited by 1,25-dihydroxyvitamin D.59 As well, 1,25-dihydroxyvitamin D (produced locally within cells) regulates gene transcription through nuclear high-affinity VTD receptors.60 These receptors are found in the classic target organs: gut, bone, kidney, and parathyroid61 and many other tissues as well, such as brain, breast, colon, heart, pancreas, prostate, skin, and immune system. Vitamin D regulates cell growth and maturation, inhibits renin production, stimulates insulin secretion, and modulates the function of activated T- and B-lymphocytes and macrophages62,63 (Table 3,1,2,4,33,59,62,64–82 Figure 1). Physiologic actions and potential benefits of vitamin D: References are listed in Tables 1,3, and 7. The major circulating metabolite of VTD is serum 25(OH)D, which has a half-life of between 10 and 19 days.5 It is the best indicator of VTD status and reflects levels from dietary intake and synthesis in the skin.83 Levels <25 nmol/L are generally considered deficient; levels <80 nmol/L are considered insufficient.84 There is some concern about the reliability and consistency of serum 25(OH)D laboratory results,85 although there has been some improvement in the quality of tests in the past few years. The 2 main assays commercially available are listed in Table 4.86,87 Liquid chromatography, which is the criterion standard, is not readily available. Vitamin D deficiency causes rickets in children and osteomalacia in adults. Rickets cases are still being reported in Canada.25,111 Osteomalacia also still occurs, but its symptoms are much less specific and are easily missed.112 Vitamin D is used to treat osteoporosis, but studies using calcium and 400 IU of VTD showed little effect on fractures. Most but not all studies using calcium and 700 to 800 IU of VTD did show a reduction in fractures.26–28,113 No benefit was seen from 1000 mg of calcium and 800 IU of VTD in a primary prevention trial29 and a secondary prevention trial.30,114 Compliance was poor in both studies, and only 63% of patients were still taking treatment after 12 months in the former study, and only 1.1% of patients had baseline VTD levels taken in the latter study. Supplementing with 400 IU of VTD for 8 weeks raised the measured 25(OH)D level by a mere 11 nmol/L in healthy men.5 To date, no studies have ensured that all subjects in treatment groups consistently had VTD levels >78 nmol/L. There is still great controversy over the benefit of VTD in fracture control. Supplementation with calcium and VTD results in a substantial 9.3% decrease in systolic blood pressure and a 5.4% decrease in heart rate.40 Supplementing with VTD substantially reduces C-reactive protein levels in critically ill patients.41 Low VTD levels might contribute to congestive heart failure.2 In 3 large prospective cohort studies, however, higher intake of VTD was not associated with lower risk of hypertension.42 Clinical trials are needed to evaluate whether the morbidity and mortality associated with cardiovascular disease are reduced by optimal intake of oral VTD. The beneficial effects of VTD on various diseases are listed in Table 7.4,35,38,44,45,48–50,73,77,78,98,111,112,117,132–145 The question is, how can one vitamin influence so many disorders in a positive way? Just as abnormal levels of thyroid hormone can affect many cell systems, abnormal levels of VTD, a hormone, appear to affect many cell systems. Our understanding of the non-bone effects has greatly increased in the last 10 years. Reported side effects of vitamin D include nausea, vomiting, headache, metallic taste, vascular or nephrocalcinosis, and pancreatitis. Reported contraindications to vitamin D include hypercalcemia in sarcoidosis; metastatic bone disease148; other granulomatous diseases, such as tuberculosis and Crohn disease (active phase) that have disordered vitamin D metabolism in activated macrophages149; and Williams syndrome150 (infantile hypercalcemia). We need to ensure that patients have healthy blood levels of 25(OH)D to prevent levels of parathyroid hormone from rising and to maximize absorption of calcium, magnesium, and phosphate. Positive effects on bone are marginal at best unless patients consume at least 800 IU/d of VTD. The emerging and exciting role of the VTD receptor and the actions of VTD in maintaining health in other cell types have become more apparent during the last decade. Inadequate levels of vitamin D (VTD) have classically been associated with bone disorders, such as rickets, osteomalacia, and osteoporosis. New research has demonstrated that VTD receptors are present throughout the body and that VTD has much broader effects than previously believed. Current recommendations for VTD supplementation might be inadequate to ensure appropriate blood levels of VTD. Les niveaux inadéquats de vitamine D (VTD) ont généralement été associés à des anomalies osseuses comme le rachitisme, l’ostéomalacie et l’ostéoporose. Les études récentes ont montré qu’il y a des récepteurs de VTD un peu partout dans l’organisme et que la VTD a des effets beaucoup plus étendus qu’on ne le croyait auparavant. Les recommandations actuelles sur les suppléments de VTD pourraient donc ne pas assurer des niveaux sanguins adéquats de VTD.
. Effect of 1,25-dihydroxyvitamin D3 on calcium and magnesium absorption in the healthy human jejunum and ileum. Am J Med 1983;75(6):973-6.
. Low vitamin D status: a contributing factor in the pathogenesis of congestive heart failure? J Am Coll Cardiol 2003;41(1):105-12.
. Effects of vitamin D supplementation on strength, physical performance, and falls in older persons: a systematic review. J Am Geriatr Soc 2003;51(9):1219-26.
. Hypovitaminosis D is associated with insulin resistance and beta cell dysfunction. Am J Clin Nutr 2004;79(5):820-5.
. Vitamin D and its major metabolites: serum levels after graded oral dosing in healthy men. Osteoporos Int 1998;8(3):222-30.
. Prevalence of vitamin D insufficiency in an adult normal population. Osteoporos Int 1997;7(5):439-43.
. Prevalence of vitamin D deficiency in Isfahani high school students in 2004. Horm Res 2005;64(3):144-8.
. Vitamin D insufficiency in a population of healthy western Canadians. CMAJ 2002;166(12):1517-24.
. Seasonal periodicity of serum vitamin D and parathyroid hormone, bone resorption, and fractures: the Geelong Osteoporosis Study. J Bone Miner Res 2004;19(5):752-8. Epub 2004 Jan 19.
. Vitamin D deficiency in a Manitoba community. Can J Public Health 1993;84(6):394-6.
. Perinatal vitamin D and calcium status of northern Canadian mothers and their newborn infants. J Am Coll Nutr 1999;18(2):122-6.
. Wintertime vitamin D insufficiency is common in young Canadian women, and their vitamin D intake does not prevent it. Eur J Clin Nutr 2001;55(12):1091-7.
. Are national vitamin D guidelines sufficient to maintain adequate blood levels in children? Can J Public Health 2005;96(6):443-9.
. Hypovitaminosis D in medical inpatients. N Engl J Med 1998;338(12):777-83.
. A high prevalence of hypovitaminosis D in Finnish medical in- and outpatients. J Intern Med 2001;249(6):559-63.
. Hypovitaminosis D among inpatients in a sunny country. Isr Med Assoc J 2004;6(2):82-7.
. Intake of calcium and vitamin D in 3 Canadian long-term care facilities. J Am Diet Assoc 2002;102(2):244-7.
. Seasonal prevalence of vitamin D deficiency in institutionalized older adults. J Am Geriatr Soc 1997;45(5):598-603.
. Vitamin D insufficiency in internal medicine residents. Calcif Tissue Int 2005;76(1):11-6.
. Prevalence of Vitamin D inadequacy among postmenopausal North American women receiving osteoporosis therapy. J Clin Endocrinol Metab 2005;90(6):3215-24.
. Vitamin D inadequacy among post-menopausal women: a systematic review. QJM 2005;98(9):667-76.
. Chronic sunscreen use decreases circulating concentrations of 25-hydroxyvitamin D. A preliminary study. Arch Dermatol 1988;124(12):1802-4.
. Vitamin D absorption in healthy subjects and in patients with intestinal malabsorption syndromes. Am J Clin Nutr 1985;42(4):644-9.
. Serum 25-hydroxyvitamin D concentrations of free-living subjects consuming Olestra. Am J Clin Nutr 1991;53(5):1281-7.
. Persistence of Vitamin D-deficiency rickets in Toronto in the 1990s. Can J Public Health 1996;87(4):227-30.
. Effect of calcium and vitamin D supplementation on bone density in men and women 65 years of age or older. N Engl J Med 1997;337(10):670-6.
. Combined calcium and vitamin D3 supplementation in elderly women: confirmation of reversal of secondary hyperparathyroidism and hip fracture risk: the Decalyos II study. Osteoporos Int 2002;13(3):257-64.
. Randomised controlled trial of calcium and supplementation with cholecalciferol (vitamin D3) for prevention of fractures in primary care. BMJ 2005;330(7498):1003.
. Oral vitamin D3 and calcium for secondary prevention of low-trauma fractures in elderly people (Randomised Evaluation of Calcium Or vitamin D, RECORD): a randomised placebo-controlled trial. Lancet 2005;365(9471):1621-8.
. Vitamin D supplementation improves neuromuscular function in older people who fall. Age Ageing 2004;33(6):589-95.
. Effect of Vitamin D on falls: a meta-analysis. JAMA 2004;291(16):1999-2006.
. Higher 25-hydroxyvitamin D concentrations are associated with better lower-extremity function in both active and inactive persons aged > or =60 y. Am J Clin Nutr 2004;80(3):752-8.
. Low-dose vitamin D prevents muscular atrophy and reduces falls and hip fractures in women after stroke: a randomized controlled trial. Cerebrovasc Dis 2005;20(3):187-92.
. Vitamin D deficiency and chronic low back pain in Saudi Arabia. Spine 2003;28(2):177-9.
. Bone health in patients with fibro-myalgia. Rheumatology (Oxford) 2003;42(10):1202-6.
. Prevalence of severe hypovitaminosis D in patients with persistent, nonspecific musculoskeletal pain. Mayo Clin Proc 2003;78(12):1463-70.
. Intake of vitamin D and risk of type 1 diabetes: a birth-cohort study. Lancet 2001;358(9292):1500-3.
. Vitamin D in type 1 diabetes prevention. J Nutr 2005;135(2):323-5.
. Effects of a short-term vitamin D(3) and calcium supplementation on blood pressure and parathyroid hormone levels in elderly women. J Clin Endocrinol Metab 2001;86(4):1633-7.
. Bone turnover in prolonged critical illness: effect of vitamin D. J Clin Endocrinol Metab 2003;88(10):4623-32.
. Vitamin D intake and risk of incident hypertension: results from three large prospective cohort studies. Hypertension 2005;46(4):676-82.
. The role of vitamin D in cancer prevention. Am J Public Health 2006;96(2):252-61.
. Vitamin D intake and incidence of multiple sclerosis. Neurology 2004;62(1):60-5.
. Vitamin D intake is inversely associated with rheumatoid arthritis: results from the Iowa Women’s Health Study. Arthritis Rheum 2004;50(1):72-7.
. Sun exposure and mortality from melanoma. J Natl Cancer Inst 2005;97(3):195-9.
. The influence of painful sunburns and lifetime sun exposure on the risk of actinic keratoses, seborrheic warts, melanocytic nevi, atypical nevi, and skin cancer. J Invest Dermatol 2003;120(6):1087-93.
. Effect of daily cod liver oil and a multivitamin-mineral supplement with selenium on upper respiratory tract pediatric visits by young, inner-city, Latino children: randomized pediatric sites. Ann Otol Rhinol Laryngol 2004;113(11):891-901.
. Association of subclinical vitamin D deficiency with severe acute lower respiratory infection in Indian children under 5 y. Eur J Clin Nutr 2004;58(4):563-7.
. Calcium and vitamin D supplements reduce tooth loss in the elderly. Am J Med 2001;111(6):452-6.
. Randomized comparison of the effects of the vitamin D3 adequate intake versus 100 mcg (4000 IU) per day on biochemical responses and the wellbeing of patients. Nutr J 2004;3:8.
. Efficacy and safety of vitamin D3 intake exceeding the lowest observed adverse effect level. Am J Clin Nutr 2001;73(2):288-94.
. A randomized controlled trial of vitamin D3 supplementation in African American women. Arch Intern Med 2005;165(14):1618-23. Committee for the revision of Dietary Standards for Canada. Dietary standard for Canada. Ottawa, Ont: Canadian Publishing Centre, Supply and Services Canada; 1976. Committee for the revision of Dietary Standards for Canada. Dietary standard for Canada. Recommended intakes for Canadians. Ottawa, Ont: Canadian Publishing Centre, Supply and Services Canada; 1983. Scientific Review Committee. Nutrition recommendations. Ottawa, Ont: Canadian Government Publishing Centre, Supply and Services Canada; 1990. Institute of Medicine. Dietary reference intakes for calcium, phosphorus, magnesium, vitamin D, and fluoride. Washington, DC: National Academies Press; 1997.
. Vitamin D physiology. Prog Biophys Mol Biol 2006;92(1):4-8.
. Overview of general physiologic features and functions of vitamin D. Am J Clin Nutr 2004;80(6 Suppl):1689S-96S.
. Target cells for 1,25-dihy-droxyvitamin D3 in intestinal tract, stomach, kidney, skin, pituitary, and parathyroid. Science 1979;206(4423):1188-90.
. Vitamin D. Am J Physiol Renal Physiol 2005;289(1):F8-28.
. The influence of vitamin D on bone health across the life cycle. J Nutr 2005;135(11):2726S-7S.
. The Vitamin D requirement in health and disease. J Steroid Biochem Mol Biol 2005;97(1–2):13-9.
. Calcium absorption varies within the reference range for serum 25-hydroxyvitamin D. J Am Coll Nutr 2003;22(2):142-6.
. Relationship between serum parathyroid hormone levels, vitamin D sufficiency, and calcium intake. JAMA 2005;294(18):2336-41.
. A global study of vitamin D status and parathyroid function in postmenopausal women with osteoporosis: baseline data from the multiple outcomes of raloxifene evaluation clinical trial. J Clin Endocrinol Metab 2001;86(3):1212-21.
. Putting cardiovascular disease and vitamin D insufficiency into perspective. Br J Nutr 2005;94(4):483-92.
. Vitamin D in congestive heart failure. Am J Clin Nutr 2006;83(4):731-2.
. Vitamin D insufficiency in congestive heart failure: why and what to do about it? Heart Fail Rev 2006;11(1):25-33.
. Role of vitamin D in the neuro-muscular function. Arq Bras Endocrinol Metabol 2005;49(4):495-502.
. Effect of cholecalciferol plus calcium on falling in ambulatory older men and women: a 3-year randomized controlled trial. Arch Intern Med 2006;166(4):424-30.
. Vitamin D and skin: new aspects for dermatology. Exp Dermatol 2004;13(Suppl 4):11-5.
. Calcium signaling in cancer and vitamin D. J Steroid Biochem Mol Biol 2005;97(1–2):145-51.
. Induction of apop-tosis by vitamin D metabolites and analogs in a glioma cell line. Recent Results Cancer Res 2003;164:319-32.
. Vitamin D and genomic stability. Mutat Res 2001;475(1–2):69-87.
. Epidemic influenza and vitamin D. Epidemiol Infect 2006;134(6):1129-40.
. Toll-like receptor triggering of a vitamin D–mediated human antimicrobial response. Science 2006;311(5768):1770-3.
. Human cathelicidin antimicrobial peptide (CAMP) gene is a direct target of the vitamin D receptor and is strongly up-regulated in myeloid cells by 1,25-dihydroxyvitamin D3. FASEB J 2005;19(9):1067-77.
. Innate defences against methicillin-resistant Staphylococcus aureus (MRSA) infection. J Pathol 2006;208(2):249-60.
. Anti-fungal activity of cathelicidins and their potential role in Candida albicans skin infection. J Invest Dermatol 2005;125(1):108-15.
. Assessment of vitamin D nutritional and hormonal status: what to measure and how to do it. Calcif Tissue Int 1996;58(1):4-5.
. Vitamin D insufficiency in North America. J Nutr 2005;135(2):332-7.
. Assay variation confounds the diagnosis of hypovitaminosis D: a call for standardization. J Clin Endocrinol Metab 2004;89(7):3152-7.
. Body fat and vitamin D status in black versus white women. J Clin Endocrinol Metab 2005;90(2):635-40.
. Comparison of commercially available (125)I-based RIA methods for the determination of circulating 25-hydroxyvitamin D. Clin Chem 2000;46(10):1657-61.
. Calcium and vitamin D status in the adolescent: key roles for bone, body weight, glucose tolerance, and estrogen biosynthesis. J Pediatr Adolesc Gynecol 2005;18(5):305-11.
. The high prevalence of inadequate serum vitamin D levels and implications for bone health. Curr Med Res Opin 2005;21(4):579-86.
. The vitamin D epidemic and its health consequences. J Nutr 2005;135(11):2739S-48S.
. The vitamin D3 pathway in human skin and its role for regulation of biological processes. Photochem Photobiol 2005;81(6):1246-51.
. Low serum 25-hydroxyvitamin D concentrations and secondary hyperparathyroidism in middle-aged white strict vegetarians. Am J Clin Nutr 1993;58(5):684-9.
. Vitamin D deficiency in obesity and health consequences. Curr Opin Endocrinol Diabetes Obes 2006;13(5):412-8.
. Hypovitaminosis D and vitamin D deficiency in exclusively breast-feeding infants and their mothers in summer: a justification for vitamin D supplementation of breast-feeding infants. J Pediatr 2003;142(2):169-73.
. Vitamin D requirements during lactation: high-dose maternal supplementation as therapy to prevent hypovitaminosis D for both the mother and the nursing infant. Am J Clin Nutr 2004;80(6 Suppl):1752S-8S.
. Prenatal and infant predictors of bone health: the influence of vitamin D. Am J Clin Nutr 2004;80(6 Suppl):1748S-51S.
. Hypovitaminosis D, insulin resistance and hypertension in pregnancy. Eur J Clin Nutr 2005;59(6):805-6.
. Inadequate vitamin D status: does it contribute to the disorders comprising syndrome ‘X’? Br J Nutr 1998;79(4):315-27.
. Assessment of dietary vitamin D requirements during pregnancy and lactation. Am J Clin Nutr 2004;79(5):717-26.
. Physiological changes in ageing skin. Br J Dermatol 1990;122(Suppl 35):13-20.
. Aging decreases the capacity of human skin to produce vitamin D3. J Clin Invest 1985;76(4):1536-8.
. Effects of antiepileptic drugs on hormones. Epilepsia 1991;32(Suppl 6):S60-7.
. Effects of thiazide- and loop-diuretics, alone or in combination, on calcitropic hormones and biochemical bone markers: a randomized controlled study. J Intern Med 2001;250(2):144-53.
. Effect of cimetidine on hepatic vitamin D metabolism in humans. Digestion 1990;46(2):61-4.
. The effect of lithium on vitamin D metabolism. Biol Psychiatry 1989;26(2):206-8.
. Effect of orlistat therapy on carbohydrate, lipid, vitamin and hormone plasma levels in obese subjects. Pol Arch Med Wewn 2004;112(6):1415-23.
. Adverse effects of hypolipidaemic drugs. Med Toxicol 1987;2(1):10-32.
. Vitamin D metabolism is altered in Asian Indians in the southern United States: a clinical research center study. J Clin Endocrinol Metab 1998;83(1):169-73. Primary vitamin D deficiency in adults. Drug Ther Bull 2006;44(4):25-9.
. Preventing osteoporosis-related fractures: an overview. Am J Med 2006;119(4 Suppl 1):S3-S11.
. Calcium, vitamin D and involutional osteoporosis. Curr Opin Clin Nutr Metab Care 2006;9(1):13-7.
. Vitamin D in the aging musculoskeletal system: an authentic strength preserving hormone. Mol Aspects Med 2005;26(3):203-19.
. A higher dose of vitamin D reduces the risk of falls in nursing home residents: a randomized, multiple-dose study. J Am Geriatr Soc 2007;55(2):234-9.
. Female asylum seekers with musculoskeletal pain: the importance of diagnosis and treatment of hypovita-minosis D. BMC Fam Pract 2006;7:4.
. Vitamin D and type 1 diabetes mellitus: state of the art. Trends Endocrinol Metab 2005;16(6):261-6.
. Vitamin D deficiency inhibits pancreatic secretion of insulin. Science 1980;209(4458):823-5.
. The role of vitamin D in protecting type 1 diabetes mellitus. Diabetes Metab Res Rev 2005;21(4):338-46.
. Efficacy and metabolic effects of metformin and troglitazone in type II diabetes mellitus. N Engl J Med 1998;338(13):867-72.
. UVR, vitamin D and three auto-immune diseases—multiple sclerosis, type 1 diabetes, rheumatoid arthritis. Photochem Photobiol 2005;81(6):1267-75.
. 1,25-Dihydroxyvitamin D(3) is a negative endocrine regulator of the renin-angiotensin system. J Clin Invest 2002;110(2):229-38.
. Vitamin D: its role in cancer prevention and treatment. Prog Biophys Mol Biol 2006;92(1):49-59.
. Vitamin D and calcium in the prevention of prostate and colon cancer: new approaches for the identification of needs. J Nutr 2005;135(2):326-31.
. Vitamin D and systemic cancer: is this relevant to malignant melanoma? Br J Dermatol 2002;147(2):197-213.
. Another paradigm lost or just a paradox? Arch Dermatol 2005;141(12):1587-8.
. Does sunlight have a beneficial influence on certain cancers? Prog Biophys Mol Biol 2006;92(1):132-9.
. Vitamin D and barrier function: a novel role for extra-renal 1 alpha-hydroxylase. Mol Cell Endocrinol 2004;215(1–2):31-8.
. Measurement of organochlorines in commercial over-the-counter fish oil preparations: implications for dietary and therapeutic recommendations for omega-3 fatty acids and a review of the literature. Arch Pathol Lab Med 2005;129(1):74-7.
. Measurement of mercury levels in concentrated over-the-counter fish oil preparations: is fish oil healthier than fish? Arch Pathol Lab Med 2003;127(12):1603-5.
. Vitamin D resistance. Best Pract Res Clin Endocrinol Metab 2006;20(4):627-45.
. Association of low intake of milk and vitamin D during pregnancy with decreased birth weight. CMAJ 2006;174(9):1273-7.
. Vitamin D and calcium dysregulation in the polycystic ovarian syndrome. Steroids 1999;64(6):430-5.
. Calcium and vitamin D intake and risk of incident premenstrual syndrome. Arch Intern Med 2005;165(11):1246-52.
. Optimal vitamin D status for colorectal cancer prevention; a quantitative meta analysis. Am J Prev Med 2007;32(3):210-6.
. Dietary calcium, vitamin D, VDR genotypes and colorectal cancer. Int J Cancer 2004;111(5):750-6.
. Can colon cancer incidence and death rates be reduced with calcium and vitamin D? Am J Clin Nutr 1991;54(1 Suppl):193S-201S.
. Calcium intake and risk of colon cancer in women and men. J Natl Cancer Inst 2002;94(6):437-46.
. Both high and low levels of blood vitamin D are associated with a higher prostate cancer risk: a longitudinal, nested case-control study in the Nordic countries. Int J Cancer 2004;108(1):104-8.
. Enzyme kinetics hypothesis to explain the U-shaped risk curve for prostate cancer vs. 25-hydroxyvitamin D in Nordic countries. Int J Cancer 2004;111(3):468. author reply 469.
. Vitamin D intake and the risk for pancreatic cancer in two cohort studies. 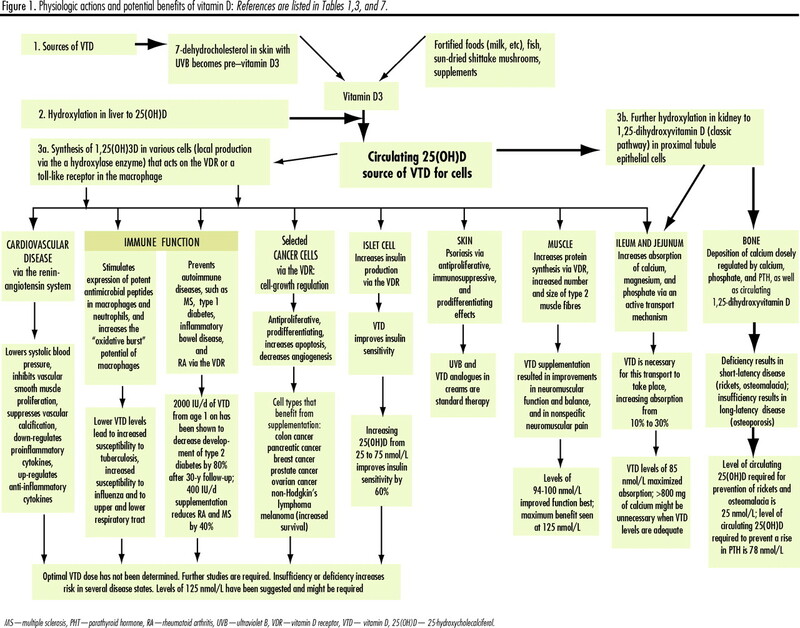 Cancer Epidemiol Biomarkers Prev 2006;15(9):1688-95.
. Vitamin D status and breast cancer risk. Anticancer Res 2006;26(4A):2573-80.
. Sunlight and mortality from breast, ovarian, colon, prostate, and non-melanoma skin cancer: a composite death certificate based case-control study. Occup Environ Med 2002;59(4):257-62.
. Sunlight, vitamin D, and ovarian cancer mortality rates in US women. Int J Epidemiol 1994;23(6):1133-6.
. Why the optimal requirement for Vitamin D3 is probably much higher than what is officially recommended for adults. J Steroid Biochem Mol Biol 2004;89–90(1–5):575-9.
. Sunlight and vitamin D for bone health and prevention of autoimmune diseases, cancers, and cardiovascular disease. Am J Clin Nutr 2004;80(6 Suppl):1678S-88S.
. Vitamin D, calcium, and sarcoidosis. Chest 1996;109(2):535-9.
. Hypercalcemia due to excess 1,25-dihydroxyvitamin D in Crohn’s disease. Am J Kidney Dis 2005;45(1):3-6.
. Persistent hypercalciuria and elevated 25-hydroxyvitamin D3 in children with infantile hypercalcaemia. Pediatr Nephrol 1997;11(1):2-6.
. Increased incidence of nephrolithiasis (N) in lifeguards (LG) in Israel. Adv Exp Med Biol 1980;128:467-72.
. Nephrocalcinosis, hypercalciuria and elevated serum levels of 1,25-dihydroxyvitamin D in children. Possible link to vitamin D toxicity. Acta Paediatr Scand 1990;79(6–7):637-43.
. Gains in bone mineral density with resolution of vitamin D intoxication. Ann Intern Med 1997;127(3):203-6.